Today on stage at E3 2016 in Los Angeles, we unveiled the next great chapter in the world of Forza – Forza Horizon 3! The upcoming open-world racing game from the team at Playground Games finds players heading to a brand new locale and, for the very first time, taking charge of the Horizon Festival. 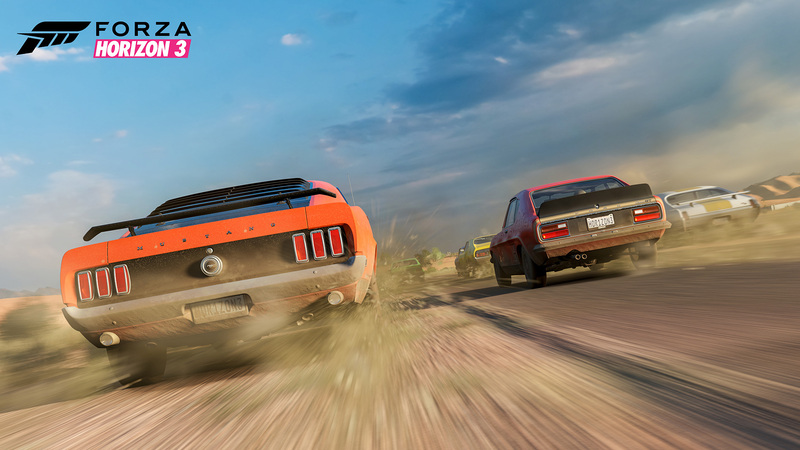 In this story, we’re going to break down all of the features that we’re showing at E3 this year to prepare you for the launch of Forza Horizon 3 on Xbox One and Windows 10 on September 27! Buckle in, friends, because we’re heading to Australia! In Forza Horizon 3, Australia is the home of the Horizon Festival. As one of the most beautiful and varied countries in the world, Australia makes the perfect setting for Forza Horizon 3 and the team at Playground has translated the Land Down Under into the largest and most diverse open world ever seen in the Forza Horizon series. Just like the real place, the Australia of Forza Horizon 3 is absolutely massive – in fact, it’s is twice as big as Forza Horizon 2’s map. More importantly, Forza Horizon 3’s vision of Australia captures the spectacular natural beauty, the tremendous diversity, and the environmental variety that makes the country one of the most popular tourist destinations in the world. Australia’s natural beauty abounds in Forza Horizon 3. From exploring bioluminescent caves that look like something out of a science fiction movie, to skipping across the beach and skimming the ocean surf as you speed past the famed “Twelve Apostles” limestone stacks, there are driving experiences in Forza Horizon 3 that players have never seen before in a Horizon game. Forza Horizon 3 is packed full of incredible diversity. 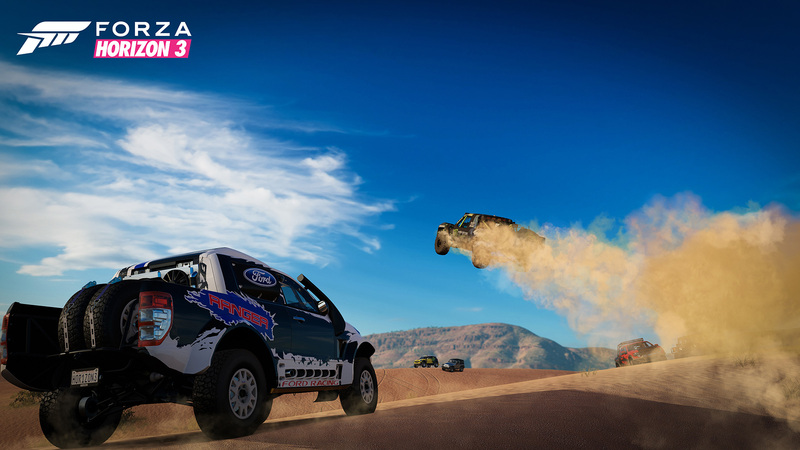 There’s the famed dusty Outback that will be a test of any car’s abilities; blasting through the dense and lush rainforests; testing your driving skills on city streets – the unique driving experiences in Forza Horizon 3 seemingly never end. You’ll explore Australia in more than 350 amazing cars including incredible models never before seen in Forza, like the stunning new Lamborghini Centenario which was just revealed at the Geneva Autoshow in March and our co-cover car, the brand new Ford Raptor. Alongside Forza favorites, including a new selection of Barn Finds, we’re bringing entirely new vehicle types into the game, all inspired by the diverse world you’ll be exploring. 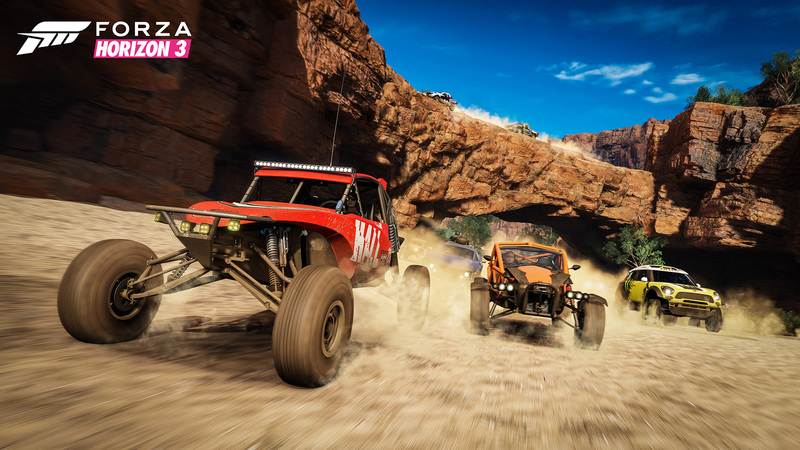 Examples include the Ariel Nomad, Class 10 buggies like the Penhall Cholla, and extreme off-roaders like B.J. Baldwin’s Trophy Truck, and many more. Stay tuned for the full list of cars in Forza Horizon 3 later this summer. Whether you’re playing on Xbox One or Windows 10, the world of Forza Horizon 3 is a constant visual delight, bringing you surprises around every bend. The team at Playground have gone to extraordinary lengths to bring you the most visually impressive Forza Horizon game ever, using state-of-the-art technology. But perhaps the best example of Playground’s innovation can be found simply by… looking up. There’s nothing like an Australian sky – big, bold, and beautiful, with dazzling varieties and subtleties in color and cloud formations. The team at Playground wanted to capture those unique Australian skies in all their glory. To do that, they’ve built a custom 12K HDR camera rig to capture the sky in incredibly precise photos – thousands of photos, in fact, creating a 24-hour timelapse video of the real Australian sky, projected onto the skydome in Forza Horizon 3. For players, it means that you’re not just surrounded by the intense natural glory of Australia, you’re also driving under authentic Australian skies. In previous Forza Horizon games, you’ve been a participant in the world’s biggest cars and music festival. In Forza Horizon 3, you’re the boss. That means you’ll be making the big decisions that affect the festival. From choosing when and where to expand the festival sites, all the way down to the music that is played and the events that take place – the decisions are up to you. Your goal is to win fans until your festival is the most popular in the world. Now, simply casting you in the role of the “head of the Horizon Festival” is one thing. The real fun is found in the power that you will have in Forza Horizon 3, which sets this apart from any previous game in the series. Simply put, you have the power to tailor every experience in the game to your own tastes. That’s done through a brand new feature we call Horizon Blueprint, which lets players create their own gameplay and instantly share it with friends. With Blueprint, you can take any of the hundreds of pre-created events in Forza Horizon 3 and customize them to your exact specifications. That can include things like changing the route for a particular event, the time of day and weather conditions, the eligible cars, event restrictions, and more. You can even give an event its own name, which is important because you’ll be able to share your event and see the events that all your friends have created automatically populated in your world. Those events will even have custom posters automatically generated based on the event type. Should you choose to play any of your friends’ Blueprint events, you’ll earn the same rewards and the same fans that you’d earn for doing the “preset” event built into the game. Between prebuilt events, your own customized events, and those events that your friends dream up, Blueprint provides a virtually limitless stream of events and fun. But it doesn’t stop there. Remember Bucket Lists – those lists of special challenges that every player should try before leaving the Horizon Festival? Blueprint works with them too. Players can use the Bucket List Blueprint to create brand new challenges, using the same tools that the game designers use. Choose a challenge type, the car you wish to use (including its livery and tuning setup), set the conditions, choose the music, give it a name, and set the difficulty by completing the event yourself. Then you can send that Bucket List Challenge to your friends as a direct challenge to see if they can top your score. While Horizon Blueprint is set to quite literally change the game in Forza Horizon 3, it’s only part of the story. Remember, as boss of the Horizon Festival, your goal is to earn fans. That means attracting the best drivers available to join you and help bring more fans to the party. That’s where Drivatars come in. Drivatars have become a huge part of the Forza experience, and being able to drive with and against the Drivatars of your friends and acquaintances is a uniquely Forza experience. With Forza Horizon 3, we’re taking that one step further, giving you the opportunity to hire and fire your friends – or, more precisely, your friends’ Drivatars. With the new Drivatar Lineup feature, you can hire a friend’s Drivatar just be finding them in the world and beating them in a race. Once you’ve got them onboard, you’ll earn rewards based on their performance in the Horizon Festival. With only a limited amount of slots available, you’ll only want to keep your highest-performing friends in your Festival – and you’ll be informed how things are progressing each time you log on to the game. If your friend isn’t getting the job done, let them go and look for another hot shoe to take their place. With 350 cars to choose from in Forza Horizon 3, players will be have no shortage of options when it comes to finding the car they love. 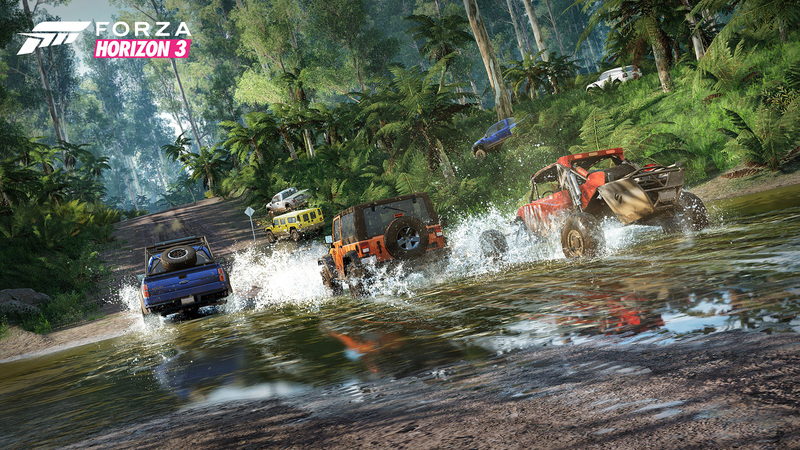 But for those who love to customize, Forza Horizon 3 will be a gold mine. We’ve got a wealth of new visual customizations for a huge number of cars in the game, including new off-road and rally parts, more than 30 new rim styles from manufacturers like Rotiform, Fifteen 52, and ADV.1 and, for the first time, widebody kits from industry leaders like Rocket Bunny and Liberty Walk. And that’s in addition to the full slate of livery and tuning options that Forza fans have come to expect in the series. Naturally, music plays a huge role in the Horizon Festival and, as the boss, you’ll have say over that as well. For Forza Horizon 3, we want you to drive to the music you love. We started by adding more radio stations – featuring new music styles like hip hop, heavy rock and punk – alongside Horizon favorite stations like Bass Arena and Horizon Pulse. Forza Horizon 3 will feature stations from labels like Hospital Records, Epitaph Records, and Vagrant Records, as well as the latest music from cutting-edge Australian label Future Classic. That’s more radio stations, covering a broader range of music, than ever before. But that’s not all. In Forza Horizon 3, we can ensure that you are driving to the music that you love with the brand new Groove Music station. The Groove Music station lets players stream their their own music on OneDrive directly into the game, as well as millions of songs from the Groove Music service. Groove Music has free trial options available for players. During this trial, you can access Groove Music just about anywhere (web, PC, Xbox, iPhone, Android, and Windows Phone) to stream and download music or manage your playlists. And whether you have an active Groove Music Pass subscription or not, you'll still be able to stream your music from OneDrive on the Groove Music station in game. Forza Horizon 3 will be the most connected, most social racing game ever. That starts with Forza Horizon 3 being the first Xbox Play Anywhere game in Forza history. When you buy the digital version of Forza Horizon 3, you’ll be able to play the game on both Xbox One and on Windows 10. You can play, save your progress at any time, and pick up on the other platform. Even better, with the power of Xbox Live, you’ll be able to seamlessly play with your friends regardless of whether they are playing on Xbox One or Windows 10. We’re making the most of that cross-platform play with our four-player campaign co-op. Everything that is in Forza Horizon 3’s solo campaign can be played with up to four players in cooperative mode. Drop in our out at will; everything you’ve earned in a co-op session with friends will carry on with you once you go back to solo play. You never have to play the same content twice if you don’t want to and your time spent in co-op will always be time well spent. As we touched on earlier, Forza Horizon 3 will carry on the long tradition of Forza games being a home for creators. From painters and tuners to photographers and more, creativity is a cornerstone of the Forza community. That’s why we’re so excited to be bringing the Auction House and Storefronts features to Forza Horizon 3. With the Auction House, players will be able to buy and sell cars between one another and the Auction House will act as a hub for fans to find the coolest cars, with striking paint jobs and fantastic tunes. The Auction House will feature a new rating system for painters and tuners based on how many downloads, likes, and uses their creations have, so browsers can quickly identify the community’s top creators. Storefront is the place where players can show off their latest creations – including liveries, tuning setups, photos, and custom vinyl creations. You can easily follow someone whose Storefront creations you like, and you’ll be informed each time they create something new. Best of all, Auction House and Storefront features will work seamlessly across both Xbox One and Windows 10. 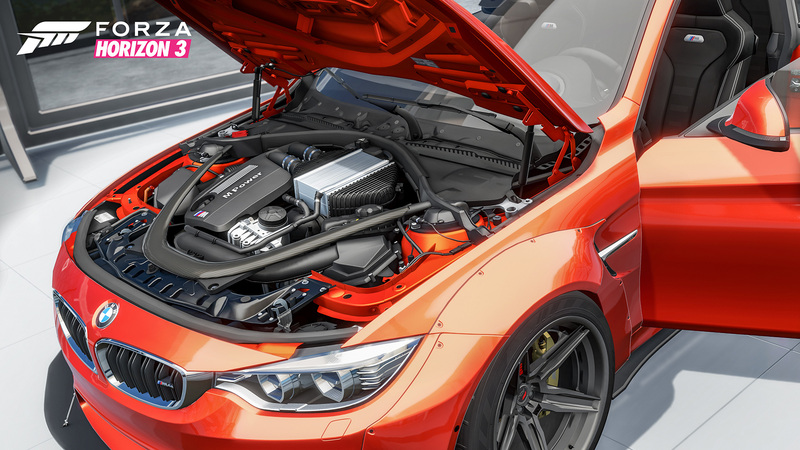 Between Xbox Play Anywhere functionality, four-player campaign co-op, Auction House and Storefront, as well as social features like 1000-player Car Clubs, Car Meets, seamless multiplayer with no lobbies, Playground games (including an all-new mode called Flag Rush), Rivals events, Online Free Roam and the new Online Adventure, Forza Horizon 3 is packed with amazing ways to enjoy some of the best cars in the world. With Forza Horizon 3, we’re building an entirely new and different vision of the Horizon Festival, a place where you’re in charge. For Ultimate Edition owners, early access to Forza Horizon 3 begins on September 23; the rest of the world will head out to the Festival on September 27. Ensure your place at the party by purchasing Forza Horizon 3 now (see our full story on the different versions available for purchase) and also take a look at how we’ll be awarding long-time Forza players in Forza Horizon 3 with our Loyalty Rewards story. Look for more on Forza Horizon 3 here on FM.net and on Forza Hub throughout the summer!